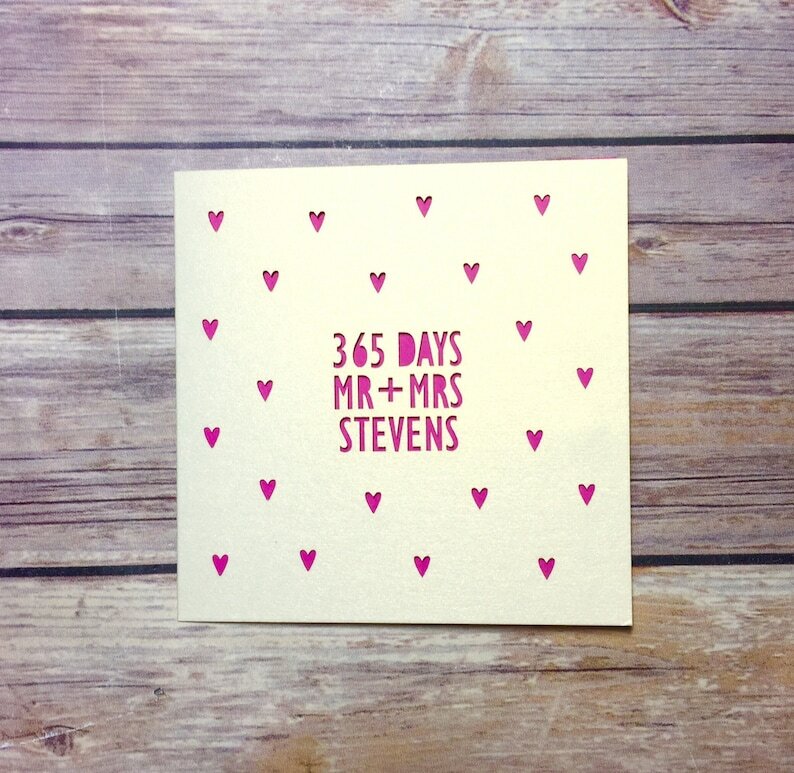 Personalised '365 days, Mr & Mrs' card to celebrate a happy couple's very special 1st Wedding Anniversary. 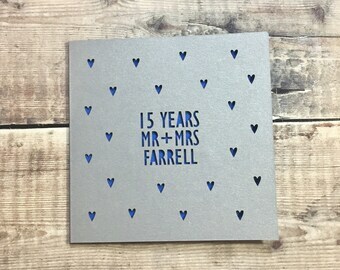 Also available in Mr & Mr and Mrs & Mrs from the shop. Please add a 'note to seller' at checkout with the surname required or get in touch if you would like alternative text in the centre of the card. 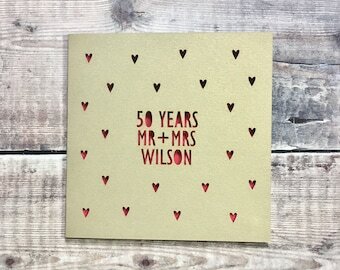 Made with your choice of 300gsm luxury pearlescent card with an ivory envelope and your choice of coloured insert. Folded size is 13.5cm x 13.5cm. Amazing my husband loved the custom card! Great material too. My shop offers payment via paypal and direct checkout. Please feel free to use your preferred method. All payments should be received within 24 hours, to prevent your order being delayed. If you are unhappy with your item for any reason, please get in touch. I will do my very best to resolve any issues. If you have simply changed your mind, you may return non-personalised items for a refund to the value of the item. You will be responsible for any return postage costs incurred. Personalised items will only be refunded if an error has been made on my part. You will have the option of receiving a replacement item or a full refund. If an item is received damaged, please send me a picture of the damage (to allow me to submit a claim to Royal Mail) and I will re-make or refund your order as per your instructions. See individual listings for shipping services available. Ready to ship items are sent within 1-2 business days after the order is received. Personalised items are sent within 1-2 business days after the order is received. If you need an item urgently, please get in touch and we can discuss all postage options. BESPOKE DESIGNS: If you would like to commission a bespoke card or frame, please get in touch and I will be happy to discuss your requirements. FEEDBACK: after you have received your purchase, I would appreciate it if you could please take a moment to leave feedback. This lets me know that your items have arrived safely. If you are unhappy with your order for any reason, please do get in touch prior to leaving feedback and I will do my very best to address the issue. I am always happy to work with you to create a custom design, whether it is to tweak an existing card design in my shop, or develop a completely new idea. Please just message me to get started! You will receive a notification email from Etsy as soon as your item has been despatched. I use Royal Mail 1st Class for all UK items and Royal Mail International Standard (not tracked) for outside of UK. From date of dispatch I would expect items to be delivered in approximately 1-2 business days (UK) 7-10 business days (EUROPE) and 7-14 business days in all other overseas locations. Please note: This can increase during busier times of the year such as Christmas. Items are not sent tracked, however if you would prefer a tracked service, please get in touch prior to ordering for a shipping quotation.